With Phase 1 – the structural conversion – completed and CatVert off to the body shop, it was time to turn our attention to the custom touches and make sure that everything was ready for when CatVert returned. 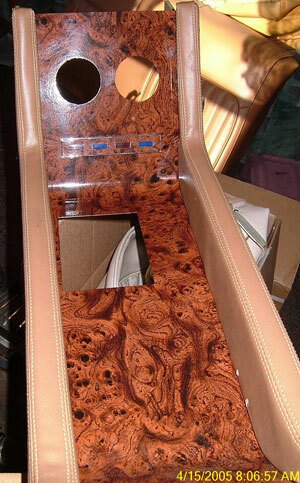 During the course of the project, we engaged Jeff Frens of upstate NY to handle the custom woodgrain work for the dash. Jeff is a collector of diecast models and couldn’t resist creating the model you see above from a SunStar diecast of an Augusta Green 1968 Cougar XR-7. That helped keep everyone focused on the vision behind the project. As noted elsewhere in these pages, the design goal was to create the Cougar convertible that the factory might have done had they know how successful the Cougar would sell in it’s first years. So that might that the convertible had to be at least as well-equipped as the best hardtop and be a little more upscale in it’s appointments. In order to keep to that vision, we had to figure out what to do with the overhead console that was installed in all XR-7’s. Each overhead console had two map lights, plus a set of indicator lights for low fuel, door ajar, and seat belt reminder. All of that had to find a new home because it couldn’t be an XR-7 without those features. That led to a decision to replace the stock XR-7 console with a ’68 Shelby-style console. Since we already had decided to convert the transmission from automatic to manual, we ordered the console for a standard shift. As you can see in the picture below, there is a good spot just below the twin gauge openings to install the light bar from the the overhead console. 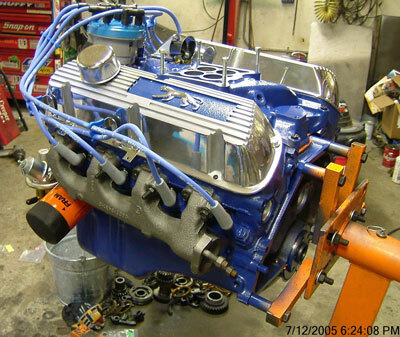 1968 XR-7’s come with a gauge package that includes oil pressure, temperature, and ammeter so we needed to decide what to place in the two gauge openings. One natural choice was a clock, since we were removing the part of the console that housed the clock that came standard with XR-7’s. And then we decided that, since much of the Cougar runs on vacuum, a vacuum gauge would be the logical choice for the second spot. Using this console posed two additional requirements. The first involved adapting the radio bezel to the housing used in Shelby’s and other non-console models, but that was quickly and easily done. The second was that the original wood grain pattern for the Cougar dashboard no longer exists and no one has been found to reproduce it. Yet the light bar has a wood grain fascia that matches the dash. Enter Jeff Frens. Jeff showed us a burled wood pattern that we really liked so we decided to use it on the console, the dash, and the face of the steering wheel for a complete matching look. Combine with the chrome bezels used on the dash instruments, it created a striking look that became one of CatVert’s standout features. You can see the result at the right and below. One benefit of using the Shelby console is that it offered a high armrest as the top of a raised console storage bin. So that was another opportunity to add a custom touch. 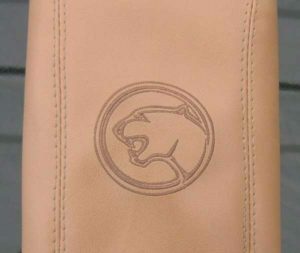 In this case it was Jeff’s wife who did the honors by embroidering a Cougar head on the armrest pad. In keeping with the idea that a factory Cougar convertible would be an upscale version of the XR-7 hardtop, we decided that the convertible would mirror the XR-7G that was available in 1968. 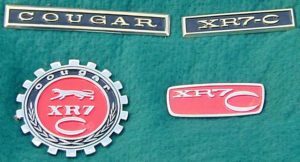 However, it needed it’s own identity so we purchased a set of XR-7G badges and had the hook machined off the G to turn it into a C and, presto!, we had an XR-7C. CatVert remains the only convertible conversion to date to have its own model designation. Here is a shot of the finished interior with the Shelby console, gauges, and dash in place. The light bar from the overhead console is in the base of the center stack area of the console below the two gauges. The map lights from the overhead console were recreated by using a rearview mirror from a late-model Lincoln with map lights in the base and wiring those into the toggle switches on the dash so they work exactly as did the originals. In the picture above, you can also see the power window switch on the drivers door, where the crank handle used to be located. In the picture below, you can see the 4-switch panel mounted just below the center armrest where it was within finger reach while driving. 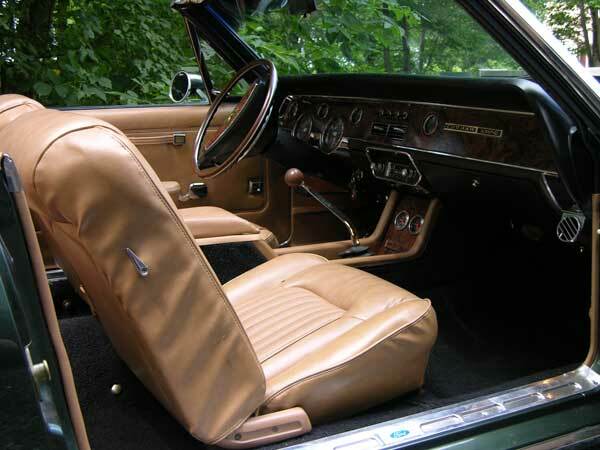 The rear seat was covered in the same upholstery as the front seats and had to be custom-made for CatVert since the Mustang and Cougar did not share seat patterns. 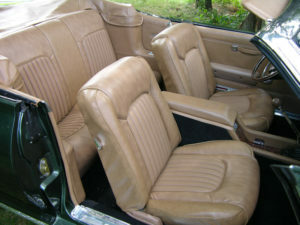 The upholstery style we used on CatVert was leather outer with a ComfortWeave inner surface.. 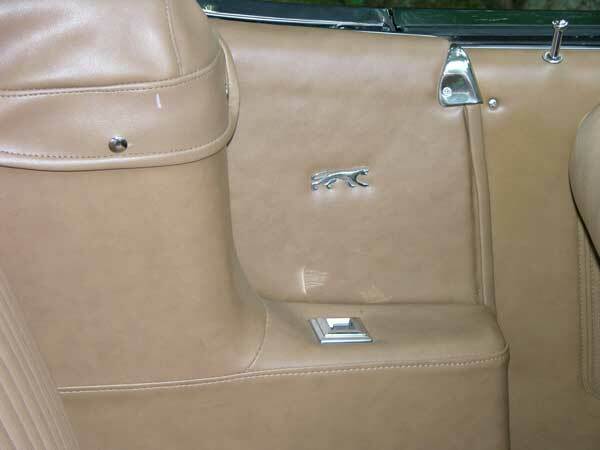 However, John’s Classic Cougars was able to provide the correct material and have it made to fit a Mustang convertible back seat. The picture above shows the power window switch for the rear seat, the custom boot for the top, and the small walking cat that we found at the Carlisle All-Ford Nationals in 2006. They were the perfect size to cover the hole in the reproduction Mustang upholstery for the quarter window crank. The chrome escutheon at the top of the door jamb was another custom touch. Of course, a beautiful interior doesn’t have the same impact of there isn’t some muscle under the hood. 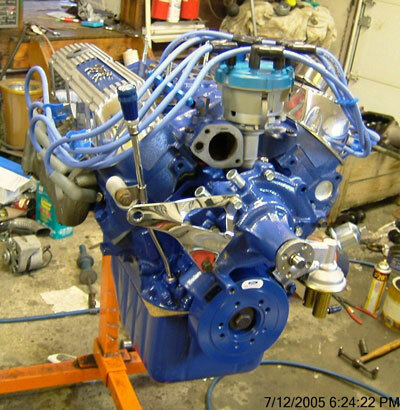 While the body and paint work were being done, Greg rebuilt the engine, adding some extra horses along the way. 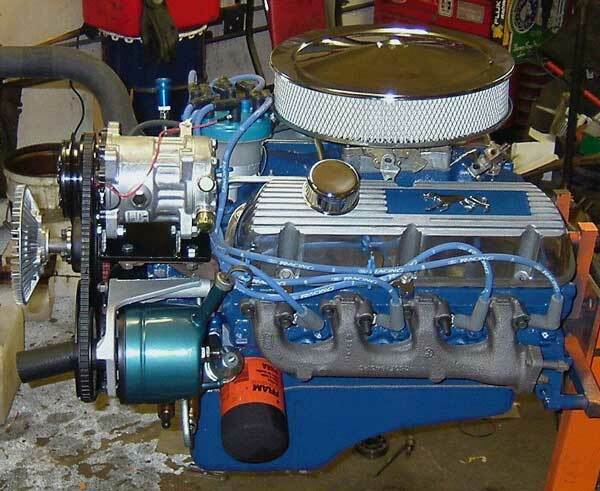 Using the original block, he added a 351 HO camshaft, an Edelbrock Performer manifold, a Ford Racing ignition setup, a lighter-weight Sanden A/C setup, and topped it off with a set of custom walking cat valve covers. New exhaust manifolds replaced the cracked originals. The new world-class T5 five-speed transmission coupled with a Ford Racing clutch made for serious performance in a car that could instantly switch to being a luxurious custom cruiser. With all of these pieces in place, Phase 2 was complete. CatVert went on to win numerous trophies and provide years of enjoyment. But, as sometimes happens, life got busy and the car ended up sitting in the garage, not being driven, and so the decision was made to offer it for sale. It sold on eBay to a retired Wall Street executive and now lives in a climate controlled garage with the rest of his collection, looked after by one of the most knowledgeable Cougar people on the planet. I do miss it and have an agreement with the current owner to have first dibs on buying it back if he ever decides to sell.